Many disc golfers in the casual scene, as well as a good handful on the pro circuit, started disc golfing in their adulthood. For some, they were introduced to the sport in college while for others it took well into their 20’s or even 30’s before they fell in love with it. Yet for DD team member Cynthia Ricciotti, disc golf came into her life at a young age. This DD Women’s Series is a special one, as we highlight one of our exceptional junior players and learn how she balances competing, practice, and school work! Cynthia gave us some insight into how she started playing and what’s it’s been like to have the support of her friends and family along the way. You could say that Cynthia’s love for disc golf started at school, yet you can’t discount the fact that her own father used to live near La Mirada many years ago. His familiarity with the sport helped when Cynthia was given disc golf as an option at her middle school’s intramural sports program. 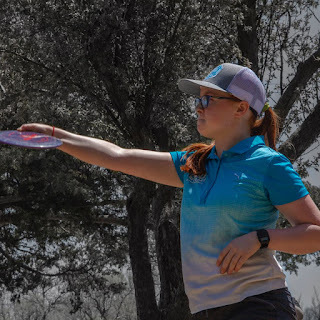 “I had never heard of disc golf, so I thought ‘let’s try something new.’ I signed up for disc golf, we went out to the local Play It Again Sports, bought discs, and went out throwing to get a head start,” she says. It was either disc golf or kickball, and Ricciotti wanted to expand her horizons. Both she and her dad instantly gravitated toward the sport, yet before school started she got a bit of bad news. Only three people had signed up for the disc golf class, so it was canceled. Yet in the short time she spent with her dad at their local course, disc golf had already made its mark. “I wanted to be an athlete but I hadn’t found a sport that I could successfully do that. I knew that I had to keep pushing and keep going. I got the bug super quick,” Ricciotti shared. With her dad as her coach, Cynthia finds that her love of disc golf has been welcomed by others with open arms. Although her mom doesn’t attend every tournament, you can see Ricciotti and her father traveling to local events as their schedule permits. “There’s only a few people in my town that are juniors. My best friends don’t play, but they are super supportive and they know how much disc golf means to me,” she shared. With this kind of support, Cynthia has been able to excel at a rapid pace - she’s already collected 10 career wins and will be entering her sophomore year of high school this fall. So far it seems like it’s been worth it, as she explains, “Getting to the level I’m at took a lot of hard work; especially at my age it included a lot of sacrifice and determination to get where I’m at.” Be sure to stay tuned for Part 2 of Cynthia’s series as we uncover how she balances school and disc golf like a champ!